Are These Zara's It Shoes of Fall 2017? We do our best to give the new arrivals of every Zara category our full attention, but we'll admit that (and you may have noticed this already) our first stop is always the shoes. And given how affordable they are, how many covetable on-trend styles the retailer stocks, and how quickly many of them sell out, can you blame us? Zara just started churning out the first of its fall collection (see also: two of our Zara-obsessed editors' thoughts on it), and while we couldn't ignore the plethora of cool "ugly" leggings, what we were most intrigued by were the shoes. In terms of shoe trends Zara is endorsing for fall, sock-style ankle boots, white leather shoes, kitten heels, and slouchy boots abound. 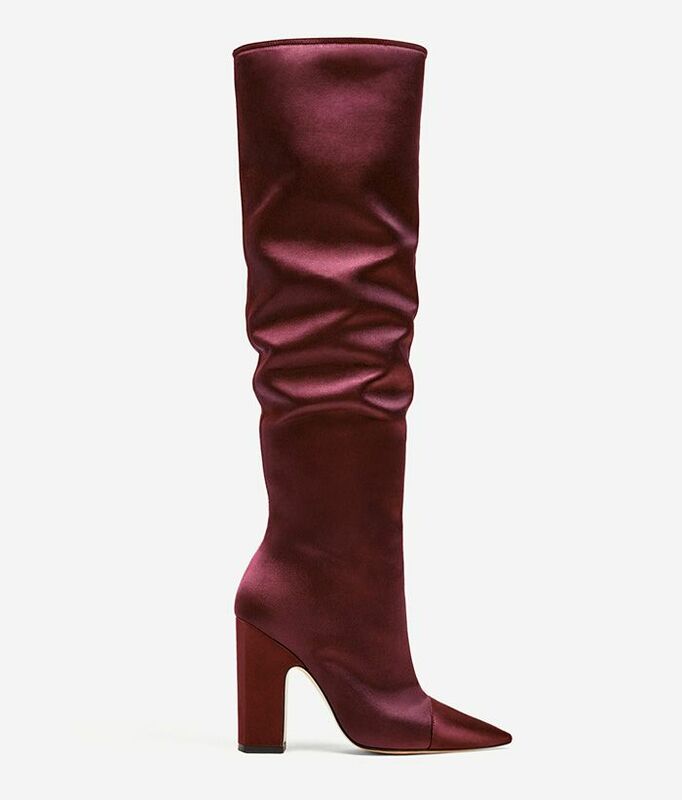 And one pair, in particular, combines two of those trends to form one gorgeous pair of boots. The style in question is a pair of slouchy, high satin boots with block heels and pointed toes. Well, lo and behold, they're nearly sold out in both the burgundy and navy blue colors on offer (and they just added a red pair, which appears to be stocking soon). The gorgeous, rich boots look so expensive and are sure to leave many fashion girls stalking the product page in hopes of a restock. Keep scrolling to shop the new Zara It shoes while you still can! Next, find out which ankle boot trends everyone will want to try in two months.